A few days ago, Dan Primack and Erin Griffith from Fortune put out an article entitled “The Age of the Unicorn” along with a nice list of the 80+ unicorns currently in business. In addition to providing a working definition of the “unicorn” (essentially a pre-IPO tech startup that has reached a $1B market value), Primack and Griffith go on to describe some of the characteristics of today’s post-bubble unicorns and why these companies have become much more commonplace. I decided to spend a little time looking at their list and gathering a little bit more information on these companies. Another characteristic worth noting is when these companies were founded. The average company life of these unicorns is 8 years—not all that surprising until you consider the fact that many of these companies have been unicorns for several years before Fortune published this list. In fact, the speed with which some of these companies have reached unicorn status is unparalleled. 7 of the companies (~9%) were founded in the last 2 years and 31 (~40%) were founded in the 6 years since the financial crisis. A mere 12 unicorns (15%), are dot-com survivors (founded in 2001 or earlier). A final characteristic of the unicorn list worth noting is where they were founded. The chart below shows a story that is not all surprising—namely that the Bay Area is still King when it comes to producing fast-growing tech startups. That being said, the Bay Area’s “share” of unicorns, at 44%, is certainly not what it used to be. 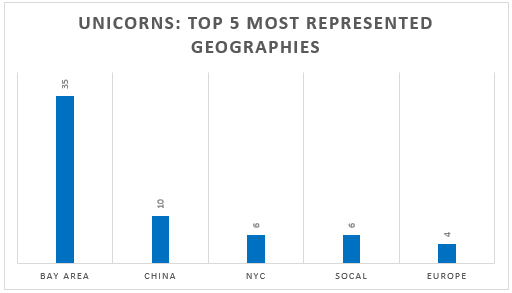 China is clearly a major force in the production of unicorns as is NYC and Europe. The surprise from a geographic perspective appears to be Southern California in 4th place—bolstered by the likes of SnapChat, SpaceX and JustFab. While not shown in the chart below, Boston and India are both tied for a close 6th with 3 unicorns each. Interestingly, each of India’s 3 unicorns are in the online retail/commerce space: FlibKart, SnapDeal and InstaCart. There has been much debate on the drivers behind the growth in the number of unicorns, the macroeconomic implications of more privately held $1B+ companies and the possibility of a growing bubble. Griffith and Primack’s article provides a great overview of these debates and other related issues. One implication that is pretty evident, however, is that the IPO markets need to continue to stay strong in the next few years or venture investors are going to face disappointment. A quick example will help illustrate this point. Let’s say you’re a VC who recently invested $100M into the latest round of a fast growing startup at a $900M pre thus providing the company with unicorn status based on its $1B post. As a VC, you’re looking for at least a 3x cash-on-cash return on this investment. In order for you to realize that type of return, the company you invested in needs to exit for at least $3B. Very few companies in the F500 can afford an acquisition of that size. Thus, in order to realize that kind of return, you will push the company (and its management team) to go for the IPO. This push for an IPO may be aligned with the founder’s goals but it may also come despite the attractiveness of an acquisition from the founder’s perspective. Even if there is full alignment on exit strategy, the whole thing will unravel if the IPO markets cool and there is no demand for these assets. Thus, the Age of the Unicorn is strongly tied to the strength of the IPO market. In the coming months, I think we’re going to hear a lot more speculation from the venture community on this very topic.